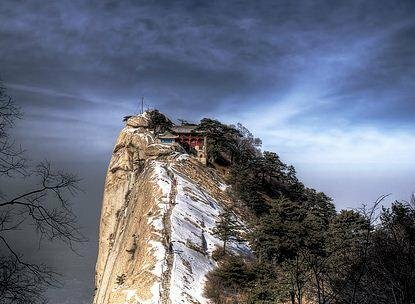 Huashan Mountain, also known as Mount Hua, is a natural highlight near Xi&apos;an in the greater Shaanxi province. The landscapes seen here at one of China&apos;s Five Great Mountains are unforgettable with very dramatic clouds and fogs any time of the year. We will pick you up from your hotel and start our journey to Mount Hua. The trip takes about 2 hours since the mountain is located about 120 kilometers from the city. There are 5 main peaks with each one more impressive than the last; greenery grows on the rocky mountainsides creating dramatic and lush views. The highest point is 2,160 meters (7,087 feet) above sea level. Throughout the park, you will encounter temples and other religious structures, especially Taoist ones. Various hiking paths cross the park, some shorter and some longer, though the majority are known to be quite steep and narrow. A roundtrip cable car ride is included if you do not wish to hike 4-5 hours, although the trekking is the ideal way to gain a personal experience with the mountain. At the end of the day, you will travel back to Xi&apos;an and we will drop you off at your hotel.